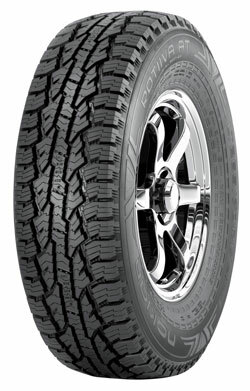 Next generation All-Weather and All Terrain tire from Nokian. 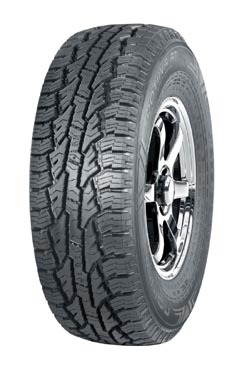 This tire boasts stone ejectors, central rib stabilizers, and the severe service symbol winter tire rating. Stone Ejectors - Keeps main grooves clean preventing "stone drilling" and as a result helps to extend the life of the tire. Severe Service Emblem - Carries the Severe Service Emblem exceeding government snow condition regulations. Center Rib Stabilizer - Improves stability in all driving conditions, especially in powerfull accelerations. The stabilizer ensures that the tread pattern, which provides such good grip, doesn’t flex too much. This means that driving stability remains outstanding, even on a dry surface with good grip. Rotiiva AT Plus available in select LT-Rated sizes.